Booking a spontaneous trip to San Antonio was such a great way to kick off the spring season. I got to visit and catch up with my friend, Meaghan @solllunaa, who recently moved back to Texas. She gave me the warmest welcome upon arriving at the airport as she showed up with a sign that said: "When She Roams in Texas." Ha! How sweet is that? I've always wanted to explore Texas, and what better way to tour the city than with someone from the area. I didn't have a set agenda, so I let my friend lead the way for the day. I only had 24 hours in San Antonio, and I want to explore the city like a local. San Antonio has a plethora of local events to choose from. From culinary festivals to outdoor activities, there's always something for everyone. As for us, we headed out to a Mardi Gras Style pet parade, aka Mardi Paws. All the dogs and cats were dressed up with the funniest costumes, which made this trip already worth it. There was also a wide selection of drinks and food available, including boiled crawfish from a New Orleans restaurant called Cookhouse. It was SO good. I debated having a second bowl. Named one of the best coffee shops in the city, Press Coffee is a definite must-see. This coffee shop had a beautiful and welcoming architecture. It had big inclined windows that allowed natural light in and a narrow lofty space on each corner for people to hang out or study at. With its earthy atmosphere and heavenly drinks, this greenhouse-shaped cafe is a perfect hub for coffee lovers; plus they have the friendliest baristas. I sure enjoyed my little cup of cappuccino and small delicious veggie quiche. It was the perfect afternoon snack. After a quick energy boost, we headed to a parking lot filled with local retail trucks and shops. My friend and I checked out some of her favorite local stores such as Chic'tique, Bexar Goods Co., Travelers Barbershop, Mila Coffee, and The Red Cat. I even met some of the business owners and got to know a little bit about their businesses. Chatting with them has made me appreciate San Antonio more. I loved how they all support each other and how passionate they are about investing in the community. As much as I love exploring like a local, I still wanted to visit some of the most famous sights in San Antonio. 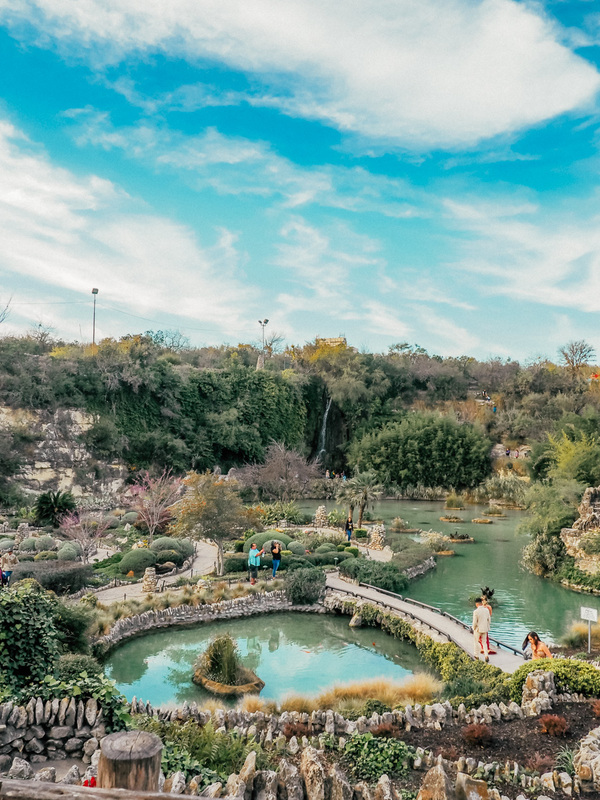 The Japanese Tea Garden, also known as the Sunken Garden, is a favorite place for locals and tourists alike. It had lush gardens, stunning walkways, stone arch bridges, Koy ponds, and a magnificent waterfall. After wandering in the park, my friend then showed me where the locals go to watch the sunset. We went around the right side of the garden, passed the cat sanctuary, and hiked above the waterfall. This spot had a great view of the San Antonio skyline. We then continued along the pathway and stopped on a bridge, where we watched the sun disappear. After only spending half a day in San Antonio, I already know this city loves its quirky hidden gems. My friend took me to this unique cocktail lounge called The Modernist. At a glance, it looks like a quaint little house, but it's equipped with a cocktail bar inside. The bartenders made drinks based on our palette and preferences, which made this place even more special. The place wasn’t very big, so we decided to enjoy our cocktails out in their Tiki-themed backyard. It was chilly out, but luckily there were heat lamps and blankets, and a cool trailer with a fully stocked bar. When in Texas, one must have tacos! There are several “best Mexican restaurants" to choose from online. It was kind of hard to pick one, let alone get in one! The first one we went to was jam packed and had a two hour wait. We settled for another high-rated place called The Fruteria, and what do you know - the food was amazing! My friend and I both ordered the shrimp tacos, loaded with cotija cheese. Yum! The fiestas don't seem to end in San Antonio. The next day, we headed to a famous three-block outdoor plaza, the Historic Market Square. There were over 100 locally owned shops, offering Mexican goods and treats. Of course, we had to stop by Mi Tierra. Located in the heart of downtown San Antonio, this vibrant restaurant and bakery is a must-try. It had the most fun and colorful atmosphere. The restaurant had festive decorations hanging from the ceiling and a very entertaining mariachi band. Unfortunately, I didn't have time to sit down and try their food, but we did get some sweet Mexican pastries to go. Getting a taste of what the locals do for fun was a great way to experience San Antonio. I can't wait to explore more and visit my friend again! Have you ever been to San Antonio, Texas? What was your favorite thing about the city? Comment below!